This is the variant cover for this issue. At the start of the issue, we get a nice little recap of events from the previous issue, and indeed even a nice little recap of who and what the Witchblade is. For returning readers, and new readers even, this is a nice little touch to get you up to speed with things so that you don’t feel lost. Once we are through with the recap, we move into the main story itself, set just a few hours after the ending of the previous issue, with Sara in the hospital and the town Mayor seemingly quite pissed off with the latest (attempt) in a line of gruesome murders that the town has seen recently. For what its worth, the Mayor is a pretty fun character. He pretty much opened the previous issue and he does so here, again. But the real star of the opening is Sara’s deputy Kate Rooney, who is drawn wonderfully well by Laura and has some great moments that help set the tone for this issue. Given the overall story going on here, I’m really intrigued as to what direction Ron Marz is taking. The flashback events with Sara and Patience, the current woman to serve the Catholic Church as the warrior Magdalena, informs much of the narrative. 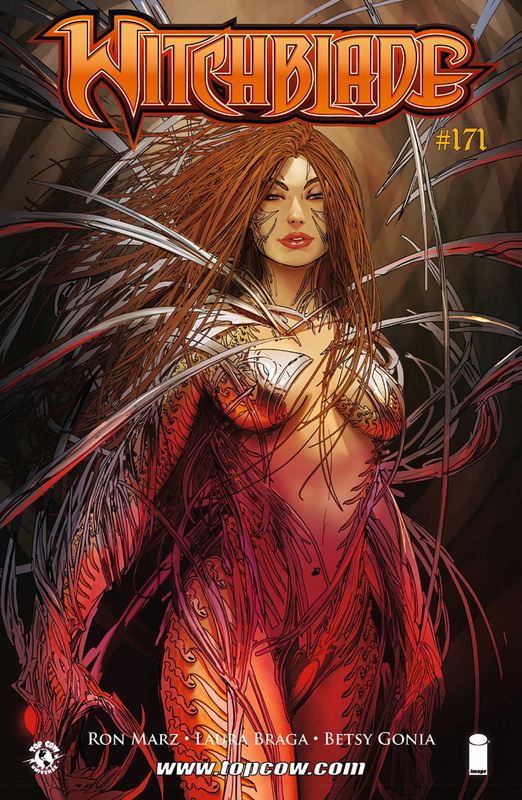 We’ve already been told that Sara gave up the Witchblade a few years ago, and the flashback shows how it all went down, and none of it was good. This has all come back to haunt Sara now in her present, serving as the Sheriff of a small place like Saratoga County, and she is in for one hell of a rough time. Since the introductions are all over by this point, we are fully into the meat of the story now, and Ron moves things along quite well. The pacing is pretty much perfect, and I gotta say that he is building up a really cool mystery here, especially if the ending signifies what I think it does. If it is indeed what I think it is, then that’s a pretty big shake-up of the status quo for both the Witchblade and the Magdalena. We don’t get to see much of Sara this time around since most of the action in the present is focused on Kate Rooney, but the flashbacks definitely convey a great sense of who Sara is and what her feelings are with respect to the Witchblade, given that she has lost almost everything in the years since she became the bearer of the artifact. Its almost heartbreaking to see such a vulnerable side of her character, something that you don’t normally see, and I remember seeing it last in the first (big) arc of Ron’s Artifacts, which dealt with Sara’s daughter Hope being kidnapped for some nefarious purposes. Laura as the internal artist and Betsy Gonia as the colourist do a pretty good job throughout the issue. The… glossy look to it works much better this time around since I’m kind of used to it, and my only criticism of the issue is with how Sara and Patience’s faces are drawn. They are just too similar. Other than that though, I love Laura’s detailed artwork and her characterwork most of all, which is really good. Some slight issues here and there with how the characters are posed, but overall, Laura’s work is pretty solid. And Betsy gives her a lot of assist with the dark colour palettes that she uses, which build up the atmosphere and mystery of the story very well. For my money’s worth, this was a pretty damn good comic, certainly one of the best of the week. Posted on December 20, 2013, in Comics Reviews, Review Central and tagged Artifact, Betsy Gonia, Comics, Comics Review, Crime, Horror, Laura Braga, Magdalena, Religion, Review, Review Central, Ron Marz, Sara Pezzini, Stjepan Sejic, Supernatural, Top Cow, Top Cow Comics, Top Cow Productions, Top Cow Universe, Witchblade. Bookmark the permalink. 12 Comments.